Say the word alchemy and most people think of old guys in long medieval robes working away fruitlessly trying to turn lead into gold. History has always depicted them as being somewhat delusional in being committed to achieving the impossible – changing the make-up of matter! 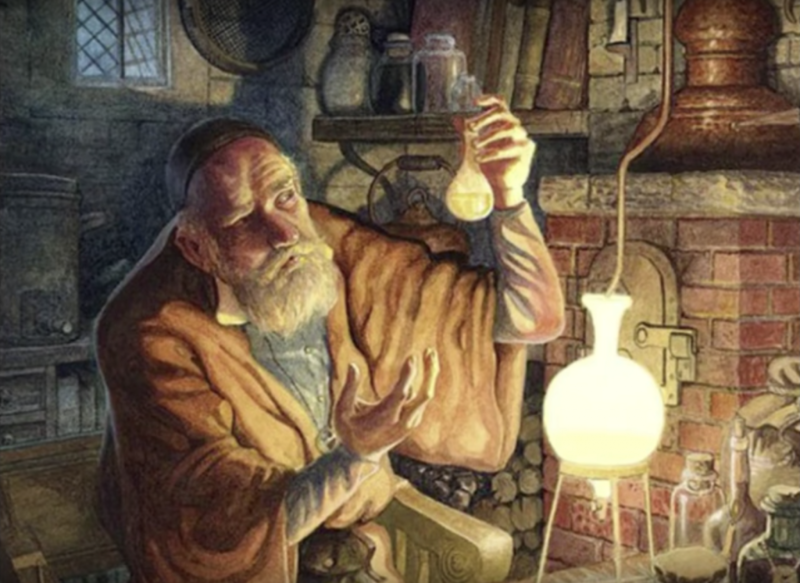 The reality for those who have undertaken any kind of investigation into Alchemy is rather different though, and it becomes apparent that the majority of alchemists are actually spiritual seekers, trying to turn the lead of the material body into the gold of spiritual enlightenment. At a time when the Catholic Church had a stranglehold on everyone’s life this was a dangerous occupation – hence it was far safer to let everyone think they were trying to literally turn lead into gold, and they couched their processes in all sorts of veiled language that only made sense to the initiated. The process of Alchemy has been compared to that of a caterpillar turning into a butterfly – the blueprint for the butterfly is held within the caterpillar, even if the caterpillar doesn’t yet know it is destined to become a beautiful butterfly! In the process of achieving this it wraps itself within a cocoon and its body starts to break down into a sort of primeval soup. From this soup the caterpillar is re-birthed into a beautiful butterfly. Does the caterpillar know that this is its destiny? Is it conscious of the process it is to go through? Or is it simply obeying a series of impulses to build and wrap itself within a cocoon and surrender to the forces moving within it? Human beings are often as unconscious – at least to begin with – as the caterpillar as they start along the long road of evolving spiritual consciousness. We often begin simply in response to dissatisfaction with circumstances or an inner restlessness. We can bumble along doing the best we can but the Alchemists of old have given us a road map we can follow if we choose to avail ourselves of it. There is a clear path, a process well laid out and documented which can make the whole process both faster and smoother. 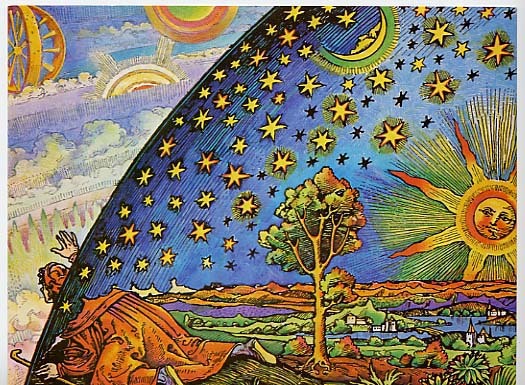 There are seven clear steps that need to be completed to reach ‘the Philosopher’s Stone’ as the Alchemists used to call their goal – that of spiritual ascension. This is what kicks the whole thing off. Often it is a process responding to a soul prompt and not a series of conscious decisions – much like the caterpillar starts to weave its cocoon due to an internal nudge or instinct of some sort. It shows up as some sort of upheaval – maybe you get ‘burned’ by a situation or circumstances, there is some sort of earthquake or upheaval in your life. It feels like the very foundations of your life have been shaken to their core. This is an archetypal wake up call. You Soul is crying out for change, for growth, for movement towards an unseen goal. Your emotions will speak to you of dissatisfaction, incompleteness, frustration, the feeling there must be something more. There will likely also be terror at the change and upheaval this brings – after all, your rut might not be what you would choose, but its safe enough and you know it! If you don’t heed this call, but keep your head firmly tucked in the sand, determined not to acknowledge the call that is sounding in your life, it will get ever louder….and louder. The nudges will become shoves, the shoves outright pushes and the pushes will literally end up sending you flying so will you or nil you, your life WILL change one way or another. All that matters is how you engage with it – with grace or kicking and struggling. This is the beginning of the purifying process. You begin to become aware of all the ways in which things are not ‘right’ – maybe you feel out of step with the people you know, dissatisfied with some fundamental aspect of your life, or maybe it even starts to feel like there are more things wrong than right. This is not about clarity – it may feel like you are in a fog, unable to see a way forwards that works for you. During this time it will feel like you are reviewing everything, reconsidering and sifting ad sorting through what works and what doesn’t, what serves you and what doesn’t, what brings you joy and what doesn’t…. Everything is breaking down – and this is a necessary process as the old has to die and be cleared away in order to birth the new. It may feel like everything is changing but you can’t see the new form of your life/relationships/work etc. Dissolution is a process of purifying and releasing ‘stuff’ that has been buried in the subconscious – ingrained patterns of behaviour that do not serve, beliefs, stuck or repressed emotions, past traumas and experiences which have left negative imprints. Also under review will be relationships that limit or restrict you, or do not serve your higher purpose. All of these will gradually float to the surface of your awareness for you to deal with. The key to getting through this stage as smoothly as possible is to let go of attachment to what comes up, which is much easier said than done, as we become very attached to the stories we tell ourselves, and tend to process our experiences through a filter that has been developed from parental and societal input which can be deeply damaging and limiting to us achieving our fullest potential. The process of dissolution is of breaking down these old, stagnant, negative forms and beliefs, of clearing impurities as we become aware of them, and cleaning up the filter. An uncomfortable, but necessary, process! The next stage continues this process, refining it and starting to gain clarity around what it is we want to keep, what we must let go of. Out of the ‘soup’ of dissolution, we are gaining clarity around discerning the Truth of who we really are, what really serves us. It is a time of deep questioning and testing what really brings us joy, serving our highest potential and our own personal Truth. It is a time of gaining clarity and understanding around the core essence of who we are, and what we are here to do. Gradually we sift and sort, getting to know ourselves and what works for us, what are our core values and beliefs, what is essential to us and what is holding us back. We may see clearly during this time things that have to be healed and reconciled, as well as the things we are ready to let go of. This is where we recognise and begin to find a way to recognise our ‘demons’ as we get ready to re-integrate everything…..
During this stage we begin to bring all the pieces back together. What emerges is a new and more authentic and aligned version of ourselves. We have found a new direction and are more centred and connected to our Higher Self and soul blueprint. We have a deeper understanding of ourselves and our role, of what we believe and what is true for us. Life seems to settle down and become infinitely more comfortable….but…. We can get stuck at this point, as we congratulate ourselves on the work we have done and believe that this is it! We stop the work, thinking it is ‘done’, and sink back into our new comfort zone….. Many aspirants and spiritual seekers get no further than this stage. They fail to see the more subtle impurities that still need to be cleansed and cleared. If you don’t keep things moving at this stage, it is rather like a game of snakes and ladders – you MUST keep the spiritual fire going to progress the work, otherwise you land on a snake and before you know it you are sinking back down again. This is where we begin to refine things. 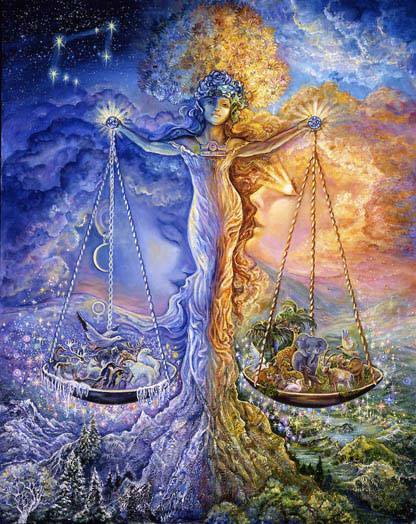 We have released and cleansed the more gross aspects and impurities…but now the more difficult task is ahead. We are in the test tube and it is a slow process of burning off the more subtle impurities. We are subjected to a gentle heat that purifies away the more subtle purities. Light comes into dark places, and there is nowhere for the more shadow aspects of who we are to hide. Whatever corruption remains within us has to go. Because we are now digging deep, deep down into the ‘sludge’ of who we are this can be not just uncomfortable, but a struggle to first illuminate and then own and release this dark places. For many this is the long dark night of the soul. All that does not serve our highest potential has to die to us, not just the more obvious aspects. This is where it becomes apparent to us that if we are to truly serve the struggle, no matter how painful, is both necessary and worthwhile. The work we have to do gets ever more subtle – any limiting attachment to ideas, beliefs, our understanding of Self have to go, including the stories we tell ourselves. We become more humble as the ego and mind takes a back seat. Instead we have to open our heart and listen to its wisdom. We need to learn to tune into our feelings (not our emotions!) as the tuning fork that is our body and nervous system will clearly let us know when we are going ‘off track’ – and we have to listen to and obey these impulses, not ignore them. We begin to have a sense when this stage is done as some sort of great understanding or spiritual vision comes to us – something the Alchemists of old called the Peacock’s tail. And this work is necessary for not just us, but humanity as a whole. If humankind is to benefit from the great evolutionary shift which is moving through our solar system, we all have to participate at an individual level. As we shift individually it contributes to the global shift until we reach the critical mass of beings required to change the paradigm. Now we start to work much more consciously with the higher energies. 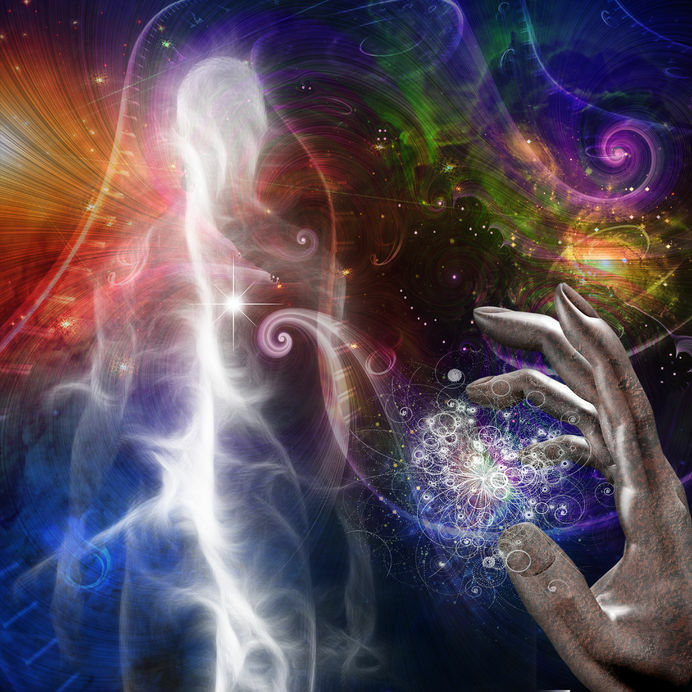 We are very aware by now that we are Spirit having a physical experience, and we can raise our consciousness up to higher levels of vibration for periods of time, where we can begin to absorb and integrate what we find there, before coming back down to the physical level to embody it. This is a process of bring Heaven to Earth, raising our vibrational rate here in the physical plane. Again and again, we will raise ourselves up and return back to the physical. The requirement here is to marry the two together. One is not better than the other. 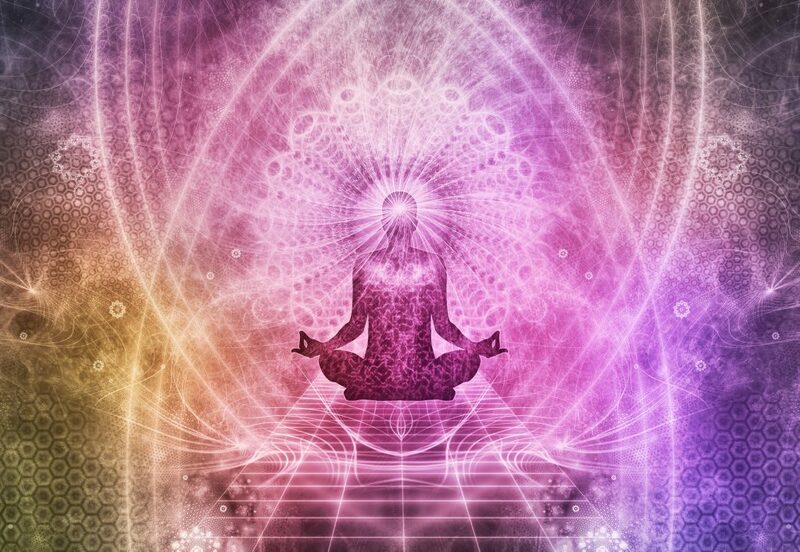 We have chosen to come to the Earth plane for just this opportunity and experience and to integrate it..
We are beginning to entrain the body and prepare it for ascension. Many people are confused about what this means and think the denser physical body is a vehicle that will be discarded, but ascension is about taking the body with us, raising its vibration to the higher planes and fully embodying the finer levels of vibration within ourselves. This is what mastery is about – it is not just gathering knowledge and experience, but applying it, again and again. That is true mastery of what we have learn. And as we do this we raise our vibration by being of service to others, bringing understanding and enabling others to follow this same path. We seek and apply wisdom again and again and again, each time refining our understanding and ourselves a little more. This is an ongoing process as we remain embodied on Earth – and it is likely that we may go through these first six steps many times as we gain ground and then lose it, each time building a firmer and firmer foundation until we are ready to move onto the next, and final, stage. This final stage is that of the Perfected Soul. It has been refined and purified until the light body is crystalised and brought into perfected form. But it doesn’t necessarily end with Earth School. Earth is just an experience in a vast galaxy of possibilities. We can continue on in other places within the Universe, gradually refining further as we work with all Creation to bring ourselves back into resonance with Source, to integrate fully, bringing all of our experience and understanding, the wisdom we have acquired back home to All That Is. The process of following the Alchemical Path is not one that every Soul is willing and prepared to take – but enough are that they can help to bring others with them. We are here to serve and to help others as we take on board and embody the understanding that We Are All One – an ancient Hermetic teaching from the mystery schools that simply, and beautifully, encapsulates a Universal Truth.